I was going through a fairly intense soundtrack phase at this time – blame Tower Records, as I’ve said before. I’d been keeping an eye on Danny Elfman ever since his first collaboration with Tim Burton on Pee-Wee’s Big Adventure, and this was probably the peak of their work together. After that, you started to gradually realise that he doesn’t have too many tricks up his sleeve. I saw Batman twice in its opening week. Really? Even then I’m pretty sure I realised that it was one of the first big blockbuster movies I’d seen that didn’t have the faintest idea of how to stop, long before that became fashionable. Anyway, here’s a track from the second album that came out to accompany it. It’s a pretty average bit of Prince funk compared with the sample-heavy loopiness of Batdance, so I’m not really sure what it’s doing here. I appear to have still been taping things off the radio back in 1989. I guess the kids have different ways these days of obtaining music they don’t want to pay for. It’s a nice enough single, but not good enough for me to want to investigate anything else that Joe Brown’s kid recorded before or since, I’m afraid. Oh, this sort of stuff was huge with John Peel at the time. I’m still not quite sure if I was enjoying it ironically or not, but it has to be assumed that ENT were in this for the LOLs, given their name, the title, and the Ronseal structure of the song. More guitars and yelling to follow later on. Factory was never the sort of label to aggressively push its artists, but Vini Reilly felt like them deciding that the eponymous guitarist needed to become a household name, and sharpish. It was crammed with expensive production and flash samples, but always at the service of Reilly’s magnificent composition and playing. And it sold bugger all. Maybe one of these days he’ll be recognised for the genius he is, but for now he’ll just be limited to a small but happy fanbase. As with Infected a couple of years earlier, the lyrics don’t really stand up to scrutiny a quarter of a century on: the jokes are sledgehammer subtle, and the politics adolescent, although it’s interesting to see that Matt Johnson was slightly ahead of the curve when predicting the onset of holy war. Still, it’s slightly jauntier than a lot of the gloomy stuff he was making at the time. I could talk about why this bit of kiddy fluff is on here rather than one of Mads’ more raunchy danceable things, but I’ve decided that I’m not going to. (Yes, women are involved. Ssshhh.) Still, it’s aged better than the raunch, surprisingly. This one’s timeless for very different reasons. I blow hot and cold when it comes to the Pixies, but I have to admit that Doolittle is a solid collection of great songs, and Monkey is one of the best. Plus, y'know, it's got monkeys in it. A slightly unusual choice for the PSBs, who I saw in concert for the first time in 1989. Their live presentation was a bit basic at that stage – just them performing in front of some Derek Jarman 8mm films blown up to the size of a football pitch. Two years later, their dementedly theatrical Performance tour would position this song perfectly, a closing lullaby right at the end of the show. The Wedding Present’s side project was a slightly unusual one – high-energy performances of folk songs vaguely remembered by the members of Ukrainian descent – but by God, it worked. Those members subsequently veered off into a separate band called The Ukrainians, and they appeared on another compilation of mine 13 years later. Back in 1989, though, they were able to surf on the popularity of world music and the exoticism associated with it, and also had David Gedge’s thrashy rhythm guitar to give tunes like this some serious welly. I was in the moshpit for their '89 Town & Country Club gig, and literally destroyed a pair of shoes with dancing. I always associate this song with that one time I saw Van Morrison do a joke. It was at the Guildford Festival, several years after this duet with Cliff Richard made its pleasant enough debut on disc. He did the song as a solo effort on stage, but made a fine effort to replace every instance of ‘God’ and ‘Jesus’ in the lyric with ‘Cliff’ and ‘Sir Cliff’. Hey, I didn’t say it was a good joke. One of those ones where I remember the album fondly, but have no idea why I picked this song over the more obviously attention-grabbing Buffalo Stance. It’s got a very mid-80s Scritti Politti feel to it, listening to it now, and that’s not really what I think you want Neneh Cherry records to do. Say what you like about Paddy McAloon, at least he’s shown his commitment to recycling over the years. Protest Songs was the first of a number of Prefab Sprout albums made up of reworked tunes from his bottom drawer (the upcoming 2013 album Crimson/Red will be the latest one). This is good enough to take its place on the likes of Steve McQueen, even though I became obsessed with what I suspect was a master tape glitch in the final repeat of the chorus, and took the CD back to the shops several times before realising it was never going to get better. Like Vini Reilly for Vini Reilly, Spike was obviously intended as Costello’s big push album – it was his first for a major label, so he got to sprawl out over an hour, hire lots of expensive guests and write a couple of songs with Paul McCartney. This still holds up, doesn’t it? Technique was New Order’s dropping-Es-and-bouncing-about-in-Ibiza record, and I haven’t listened to it for a good long while so I don’t know how that side of it has stood the test of time. Interesting to see that I went for a guitar-based tune from it that could have come from any of their earlier albums. The other theme for this year after world music: guitar-based racket. If it wasn’t short sharp bursts from the likes of Extreme Noise Terror, there was this piece of Serious Art from Branca, in which an orchestra of a dozen or so electric guitars make their way up two octaves very slowly and not quite in sync with each other. It’s all about the wonky harmonics that ensue, rather than the actual notes themselves. Always made me curious what the hell something like this would sound like live. The start of the downward slide for the Pogues, as documented elsewhere. That’s not to say they couldn’t turn out the odd slab of gorgeousness every so often, like the closing track on Peace And Love. See Extreme Noise Terror above. In 1989, I worked for a company which, when it sent you away from home, gave you a spectacular entertainment allowance of four pounds a night. Finding out while on a trip to Bristol that Napalm Death were playing the Bierkeller and charging £4 on the door led to what was possibly the second best expenses claim I have ever made in my working life. (The best one came eight years later, when the same company happily forked out for the incidental expenses for a team-building quiz I organised, which ran to two bicycle bells and a false beard.) This has probably taken much longer to read than the song has to play, hasn't it? I wasn't really aware of AR Kane's work until MARRS' Pump Up The Volume, which they were half responsible for (along with Colourbox). Their own stuff is closer to that single's B side Anitina, dreamy weightless pop with a psychedelic edge. This song is actually a bit dancier than most on the album, a nice bit of cross-pollination of influences in the wake of MARRS. 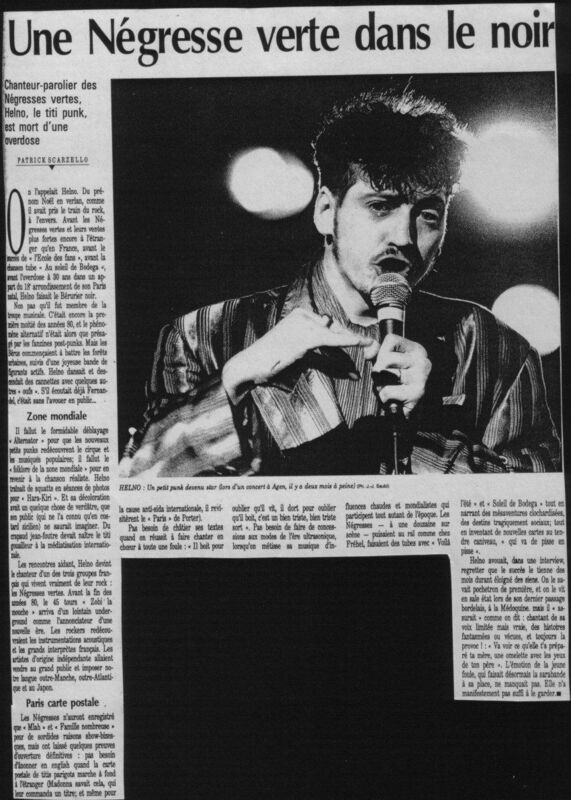 It seems like one of the most obvious pairings in the world - take Marc Almond in full tormented diva mode, and let him loose on a full album of Jacques Brel songs. This was one of the less familiar ones when I first heard it, which probably helped, as it wasn't carrying all the baggage of previous interpretations. It's fun to watch JAMC selling out bit by tiny bit as these compilations progress, while still making top records. There's so much programmed stuff on this song it's virtually electropop. But the guitars, the snotty vocals and the classical rock 'n' roll stylings make it entirely its own beast. This happens a couple of times on each of these compilations I'm revisiting: I recognise the artist and the album, but have no recollection of the song that obviously meant so much to me at the time. It didn't ring any bells at all this time round until the chorus, when Sinead O'Connor's unmistakeable backing vocals take it up a notch or six. And it's been stuck in my head for a week or two since. Nice to be reacquainted with it, anyway. Aladdin Sane (1973). Heroes (1978). Let's Dance (1983). For a while, I seemed to be locked into a cycle of buying a new Bowie album every five years. Slightly outside that came his much-derided RAWK experiment. It should have worked - after all, this is more or less the band that played on Lust For Life - but he didn't really have songs for them to play, and this blustery old thing is the closest that came to one. The next Bowie album I purchased after this was the 1993 soundtrack to The Buddha Of Suburbia, which is actually a lot better than you might think. South Park has never been one of those shows that tries to disguise the personal opinions of its writers. Nevertheless, as Robert Smith walks into the sunset at the end of Mecha Streisand, and Kyle yells after him “Disintegration is the best album ever!”, you know damn well that’s Matt Stone talking. And I think I would have at least gone part of the way to agreeing with him back in 1989. Bear in mind that at this stage I’d only been listening to CDs for a year or so, but it struck me that Disintegration made better use of the medium than most other albums I could think of: using the extended playing time as a way to explore ideas, not struggling to fill it. On a traditional LP, this track would have been half a side – here, it’s a distinct musical atmosphere that happily coexists alongside eleven different ones on the same disc. I don’t go for this sort of gloom as much these days, but Smith knew exactly how to make it work on record. It’s… all right, nothing more. I suspect at the time we were all hypnotised by the supergroup nature of Electronic – bits of The Smiths and New Order, plus the Pet Shop Boys guesting! – and there are certainly elements of all three audible in the song, with a chorus more reminiscent of the guest stars than anyone else. But it’s all a bit meh, really. The Mustaphas were well ahead of everyone else when it came to the world music boom of the late 80s, of course. But again, this is one of those tracks that I couldn’t have sung a note of until I played it again for the purposes of this article. It’s the least fun of any of the Mustaphas tracks I’ve included on these tapes, and I’m not quite sure what it’s doing here, because fun is the main thing I associate with them. Vague bells are ringing when the harmonies kick in for the final verses, but otherwise I’m drawing a blank here. I’m not quite sure why I own the box set of the Glyndebourne production of Porgy and Bess, to be honest – I suspect that having loved bits of Porgy on and off over the years, the chance to own what was being hyped at the time as the definitive production seemed too good to pass up. And the instrumental climax of New York is still one of those pieces of music that demands you turn it up as high as it’ll go, and bounce around the room like you’re on happy dus’. Try it, it’s fun. Christ. All nine and a half minutes of it? And I seemed to be doing so well this year avoiding over-indulgent 12” singles. Well done me. Fool’s Gold has a decent enough groove (I went to school with their bass player, you know), but it gets a bit wearying over this length, doesn’t it? I always wonder what was going through my mind at the time when I come across something as slushy as this on one of these compilations. Sure, it’s put together with the old-fashioned craft and attention to detail you’d expect from Jackson, but you keep expecting the sting in the tail he’d usually sneak into the lyrics, and there isn’t one there. If you ate food at a restaurant at any time in 1989, you’d inevitably have heard the Gypsy Kings playing in the background. They were that prevalent back then. Yet another band who spotted the interest in Exotic Music From Foreign Lands and ruthlessly manipulated that into mainstream success, you can’t deny that they did what they did incredibly well, even when a cover like this one threatens to go off the scale on the cheeseometer. My fondest memory of their Wembley Arena gig involves watching an English audience utterly failing to keep up with the double-time handclaps in numbers like this. Loud guitars and world music are all well and good, but hip-hop seems to have fallen off these compilations after a couple of years of token appearances. Still, the release in 1989 of one of the high water marks of the genre could never be ignored. Not quite sure why I went for this one rather than one of the more obvious singles, but there we go. “She teased so many she was known as a garden tool.” Oh, dear. Not sure of the chronology here, but I think it goes like this. First I heard Real Sounds’ utterly charming ode to the beautiful game on John Peel’s show (who else? ): then I saw them play a spectacularly fun gig in the unlikely setting of the Queen’s Hall in Edinburgh: and then I bought this record from Sterns African Record Centre in London because none of the big shops I normally went to had it. I’m sure it wouldn’t have the same punch if they weren’t largely namechecking British footballers, but that just counts as a smart move on the band’s part. When we were discussing POTY 1985, I mentioned that I owned just three Don Henley singles: and this is the third one. All of them seem to be the lead singles from his albums, which suggests that he knows exactly what he needs to do to grab people’s attention on the radio, but not quite enough to lure me into buying whole albums. The pawprints of co-writer Bruce Hornsby are all over this one, with what sounds like a cheeky quote from The Way It Is just before the start of the final verse. But that main piano riff is unstoppable, just rolling along beautifully for the whole of the song. I think well over a year elapsed between the release of Martin Scorsese’s The Last Temptation Of Christ and the release of Peter Gabriel’s collection of soundtrack music for it: I was certainly ready for the record by the time it came out. As a recovering Catholic, I have a fondness for it as a film despite the odd bit of clumsy storytelling, though I think it’s one of those movies that requires the viewer to have at least a modicum of faith going in, so they can allow it to be tested. (See also: The Exorcist, surprisingly enough.) If you go along with it at that level, the final scene is utterly ecstatic, and Gabriel’s music here is well able to match it. Barring their brief Debussy-inspired comeback at the turn of the century, Below The Waste was the last album from the Art Of Noise. To be fair, the writing was already on the wall: the band had shrivelled from five members to two (JJ Jeczalik and Anne Dudley), while the album was a mixture of gimmicky collaborations and solo tracks from those two members. Dudley was always the one happy to experiment with an orchestra: it took me ages to realise that this was her applying Burroughs-style cut-and-paste techniques to a slab of Bach’s St Matthew’s Passion. That previous sentence fails to get across how pretty it sounds, though. So that was Pick Of My Year Zero. If you're looking for signs as to how well my life plan went, there's one sign that you've almost certainly missed: as a result of some of the actions I initiated in 1989, I didn't make any POTY compilations for the years 1990-1992 inclusive. Which is going to make the final three articles in this series a bit of a challenge, but I'll see what I can do.